Hi there! I have been busy getting paintings together for my new co-op and the show I am doing February 1st. I have been painting a lot of small ones as they are more affordable, hoping that will help them to sell. There is quite a bit of glare on these but you get the idea. One is 3" x 3" and the other is 4" x 4" . Tiny and fun to paint. Thanks for visiting, it means a lot to me. Wonderful work, Barbara.. 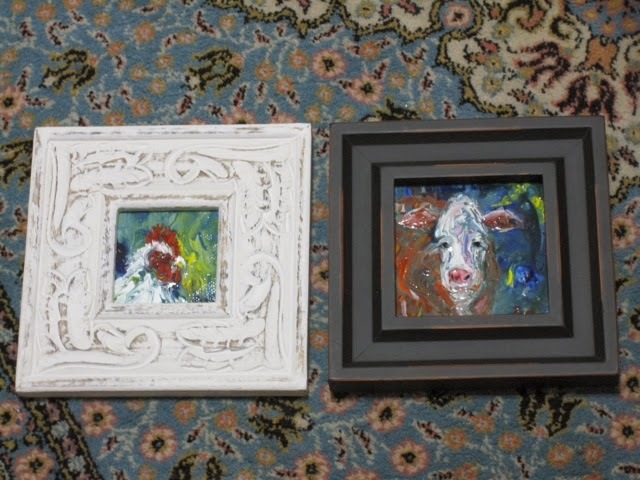 I love both of these little paintings and the framing is wonderful.!! Thank you so much Hilda, I think frames are so important. "Jewelry for the art" right? These are so cute Barb. Love the cow. Thank you so much Sharon, fun to paint animals. Barbara, good luck with the show and the co-op. I know people will love your work as I do. I love these small works, too, and you are a ROLE MODEL for having fun while painting!! Oh thank you Merdith, I just love it! Glad it shows.